Region: This fly is found throughout the western United States. Life cycle: This insect produces two to three generations each year and overwinters in the soil as a pupa. Physical Description: This 1/4 inch long fly is gray with black stripes on its thorax and resembles an ordinary housefly. The eggs are white and are laid on plants that are near the surface of the soil. The larva is also white and is 1/4 inch long with blunt shaped rear ends. 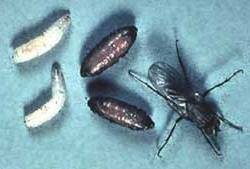 Feeding characteristics: This pest will attack cabbage, broccoli, Brussels sprouts, cabbage, cauliflower, radish, and turnip plants. The attack stems just below the soil surface making brown tunnels, causing the plants to wilt and develop bacterial or fungal diseases like Soft-Rot and black leg. Controls: You can protect your plants by placing a piece of tarpaper on the ground around the stems or cover with screening. Dust with Diatomaceous earth, Rock Phosphate, or a mixture of lime and wood ashes. Some maggots will fall prey to Rove Beetles.